Replacement headgear for the DreamWear Nasal and Nasal Pillow mask. Mask not included. Recommended Replacement Schedule: Once every 6 months. 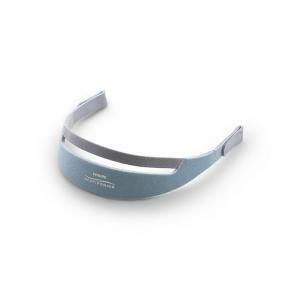 This product includes the replacement headgear for the DreamWear Mask. The complete mask system can be found here: DreamWear Mask with Headgear. Some of our customers have experienced the DreamWear headgear sliding up and off their head during sleep. The headgear will have a tighter grip if you disconnect the headgear and reattach it upside-down. When upside down, the DreamWear logo will be attached to the left side of the mask and the phillips respironics logo will be inverted. It is recommeded to wash the fabric headgear weekly. First disassemble from the mask, and then handwash in warm water with liquid detergent. Rinse thoroughly. Lay the headgear flat or line dry. Make sure the entire mask is dry before use. Mask slides up...have to Macgyver it!